This Might Be the Best Cookbook in Western North Dakota. Tasty Tuesday. Best Cookbook in Western North Dakota? Cookbooks. You can collect them. You can read them. You can cook and bake the recipes they contain. But you can do more. You can envelope yourself in history and understand culture through cookbooks. A Taste of History, the cookbook produced for the centennial of Watford City in 2014 is a large volume, filled with favorite recipes from the region. It’s one of the best recipe books from that area of western North Dakota. Often handed down from generation to generation are recipes. They represent more than just food, they represent a culture in many instances, and the history of the area in which those cultures subside. And so, it’s fitting that when a historical milestone is achieved, collections of recipes are gathered together as community cookbooks. Countless hours given by numerous volunteers are required to make such a publication come to fruition. The Watford City Centennial Cookbook from 2014 is a prime example of that. Acknowledgements for the countless hours and much dedication to produce this expansive cookbook, one of the best in the region. I like to eat, but I’ve a passion for community and family recipe collections, cookbooks. Yes, they can earmark events and eras, but most importantly they represent a special kind of nurturing. I think that is a kind of Love! Cookbooks such as this produced by the Watford City Centennial Cookbook Committee in western North Dakota are a prime example of generations of nurturing. Reading through the recipes, I might find interest in the food, but I most often feel a warmth, perhaps from a personal memory evoked. Maybe, I even feel a sense of calm and security. Knefla Soup Recipe from the Watford City Centennial Cookbook. Contact the Pioneer Museum of McKenzie County in Watford City, North Dakota, for availability. Borscht Recipe from the Watford City Centennial Cookbook. Contact the Pioneer Museum of McKenzie County in Watford City, North Dakota, for availability. The recipes in this cookbook are shared by the community, and many are shared through generations. Some are quick, every day recipes, but some are treasures from the past, a means of carrying on a culture. Rosettes Recipe from the Watford City Centennial Cookbook. Contact the Pioneer Museum of McKenzie County in Watford City, North Dakota, for availability. As you look through the recipes here, many selected from the Heritage Section of the Watford City Centennial Cookbook, take time to imagine the skilled hands, the knowledgeable and practiced person preparing it. Whoever that was, they gave their most precious commodity in order to produce the finished product. Their time. That’s an amazing and valuable gift. Fattigmand Recipe from the Watford City Centennial Cookbook. Contact the Pioneer Museum of McKenzie County in Watford City, North Dakota, for availability. You may find inspiration to do the same, to give that same gift. When I read through my family recipes, and use them to provide food for many family and loved ones, I feel as though I’m experiencing a little bit of the person who passed on the recipe. Do you ever have that feeling? More? You Betcha! But Where? How many cookbooks can you think of produced in your community? How many do you own? What’s the oldest cookbook you have or use? Or…..maybe you’ve collections of recipes not in cookbooks, recipes which should be shared. Where is the best place to find old community cookbooks? Please share your favorite cookbooks, recipes, and tips where to find such publications. What a wonderful way to nurture and spread some love! And….good food to eat! Creme Brûlée recipe from the Watford City centennial cookbook, “A Taste of History”. Contact the Pioneer Museum of McKenzie County in Watford City for information about this cookbook. Bread Pudding, Outlaws Bar & Grill, Watford City, ND from the Watford City centennial cookbook, “A Taste of History”. Contact the Pioneer Museum of McKenzie County in Watford City for information about this cookbook. What Are Your Thoughts and Memories? Let Us Know! Please share your thoughts and insights. Got a good recipe? Got a cookbook to promote? Do you have a special memory to share? 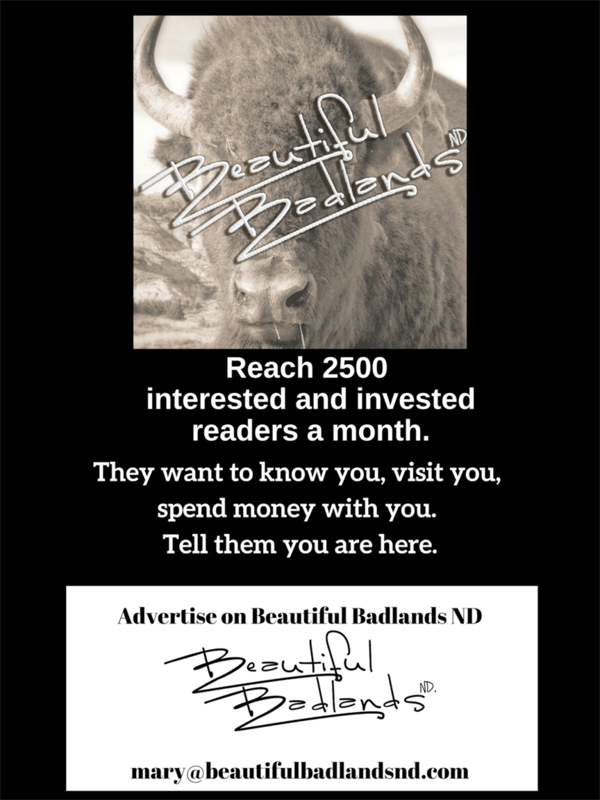 Email me at: mary@beautifulbadlandsnd.com Or message me/comment on our Facebook page: Beautiful Badlands ND I’m hoping to hear from you! You might check out these volumes which are a compilation of recipes provided by readers of the Facebook page, Recipes of North Dakota. You’ll find time tested recipes in these two cookbooks, the result of a Facebook page entitled Recipes of North Dakota. For more information about the Pioneer Museum of McKenzie County, click this: History Comes Alive Here! Another museum of importance is the Monday Heritage Center in Sidney, Montana. Click here: You Didn’t Know About This! A hidden gem in western North Dakota, but one of the best sources of cultural and historical information of the area is the Dunn County Historical Society Museum. Click this link: You’ll be Wowed by this museum! Like our Facebook page Beautiful Badlands ND and subscribe to our newsletter. We’ll keep you up to date on What’s Happening in western North Dakota and eastern Montana. Need a speaker? Need content for your publications? Contact us!